I was doing a track session last Thursday and as I was doing an all out 300m at the end of the rep I could feel my form falling apart. My arms began swinging side to side, my legs began hitting the ground further ahead of me, scraping the ground in front and pushing off. I thought nothing of it – it’s hard to when you’re focusing on finishing each rep as fast as you can. At the end of the rep, one of the sprint coaches came over to me and told me that my running form was inefficient. Part of me was unsurprised as I knew that it was one of my weaknesses. I didn’t ask what he spotted right there and then, because I was out of breath, but after completing my session I approached him and asked. He clarified to me that I was leaning too far forward, my legs were striking the ground in front of me and my arms were beginning to swing more sideways. This sort of poor running technique means that I waste more energy than necessary when running and can place extra stress on other parts of the body. A lot of these weaknesses can be improved by simply having an increased awareness and further understanding of what your running technique should be like and by doing strength exercises to improve the muscles in your lower and upper body which tend to be neglected such as the hip abductors, hip adductors, trapezius, lattisimus dorsi (back muscles) and glutes. By leaning forwards you are tiling your pelvis forwards, effectively reducing the range of motion in your hip flexors. This means that you cannot live your legs as high when running and therefore your stride is shorter – just try seeing how far you can lift your leg off the ground when you’re leaning far forwards! Leaning too far forwards can place extra strain on your lower back as it attempts to stabilise your running form. This can throw your lower body out of alignment leading to all sorts of problems such as knee pain down the line. Too much of a forwards lean will lead to a less efficient running style causing you to fatigue quicker. Errors in my technique: leaning too far forwards, heel striking and chin jutting forwards. Tamara however, has an upright position and good forefoot landing. 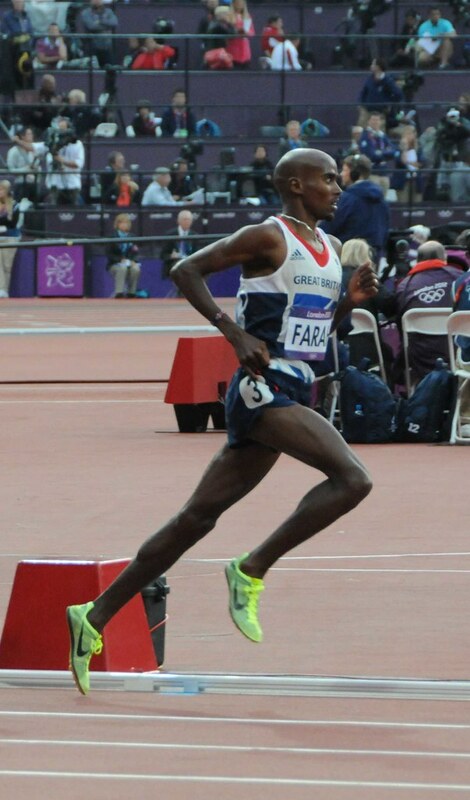 Mo Farah has a minimal forwards lean and a good forefoot push off. To correct this, try doing exercises which work your lower back, glutes and hamstrings. If your hip flexors or quadriceps are particularly tight, this can also encourage a forward lean so try to loosen them up by massage, hot baths, resting and stretching. Think about keeping your shoulders rolled back and your hips pushed forwards when you run. 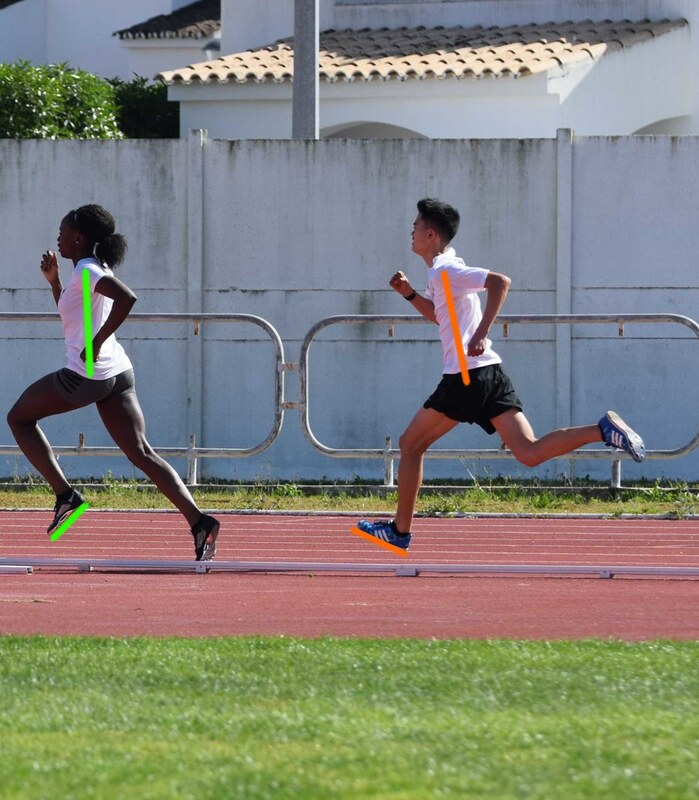 Your centre of mass lies where your hips are and your centre of gravity when running should be in line with your centre of mass which is why you need to try and maintain a neutral spine position when running and an upright posture. The further you strike the ground away from your centre of mass, the more energy you are wasting as this is less efficient. Striking the ground right under your body is the most economically effective way to push off and reduces your risk of injury. By striking the ground in front of you, there is a more pronounced shock that goes through your leg which can increase your chances of developing knee pain. This is because when you strike the ground ahead, a force known as ground reaction force (Newton’s third law of motion – law of reaction) sends energy back the way it came (so backwards) which is not the way you want to be running. Striking the ground underneath your hips allows this energy to be returned vertically and used more efficiently. This will reduce the shock being absorbed directly through your knee and is especially important when running downhill as this is where knee injuries are prone to happen. For me, sometimes, I will tilt my head back too far and my chin will stick out when I am running. This happens when I ‘trick’ myself into thinking I’m leaning back and I have good form. I will tilt my head back so my chin juts out leading a terribly awful looking running style. Let your gaze sit on the horizon or firmly forwards and make sure your head is not too far forwards or backwards as this will lead to as less efficient running style. Make sure it sits perfectly on top of your body. When you’re running you’re trying to go forwards, not sideways so any movement towards the side is a loss in energy which could have been used to run faster – forwards. Typically, this is referred to as ‘skiing arms’ when your arms move side to side. 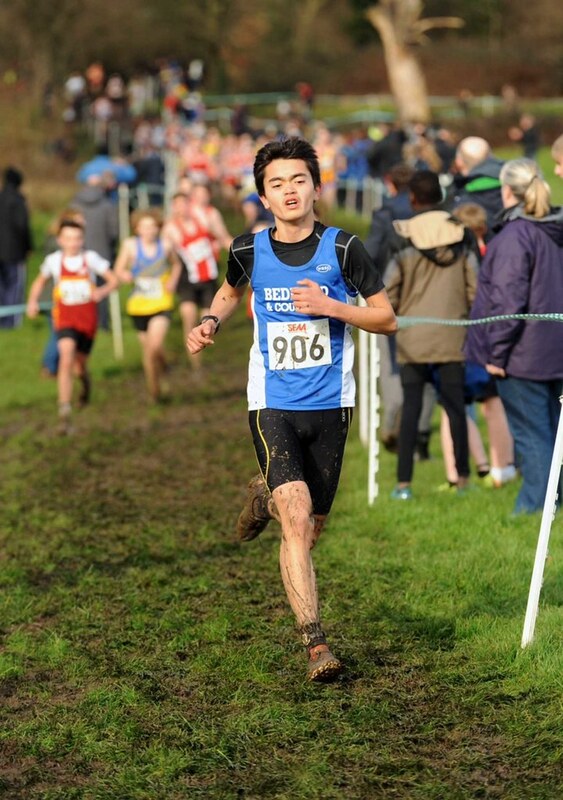 It tends to happen in cross country as a lot of energy is used trying to stabilise your body when running through the mud and various terrains. Try and focus on bringing the tips of your fingers from your hip to your chin. The way I was taught to remember it was ‘hip to lip’ or ‘pocket to socket’. By doing strength exercises focusing your back and shoulders you can help maintain a forward arm swing when you begin to fatigue. Whilst I wouldn’t consider myself a heel striker, my poor form may have lead to me feel striking during the training session pictured above. Your foot acts as a spring when running and to make the most of it, you should try and land between forefoot and midfoot. This will help the arch in your foot to absorb energy put into the ground and use it to propel yourself forward. When you land on your heels, despite the cushioning you may have on your shoes, a lot of shock will go through your knees and you are more likely to strike the ground in front of your centre of mass which can lead to a poor running technique. If you’re not convinced, it’s the reason why all running spikes have their spikes at the front of the shoe! Are there any particular points I may have missed? Let me know down below! How Should Runners Warm Up?